Earasers Musicians Hi-Fi Earplugs XS Reduces 19dB Harmful High Frequency Sounds. Shipped with USPS First Class Package. New in open box. Box was opened to verify contents. ACTUAL PHOTOS. Please see photographs for exact condition. I am an individual who takes pride in my listings. I strive to describe details to the best of my knowledge. I ship the next business day. I am easy to work with, so please email me with any questions before buying. Thanks for supporting small business. Please check my store for more great deals! Whether you are a musician, attend concerts or are regularly exposed to music played at high levels, Earasers don't plug up your ears and muffle sound like more conventional earplugs. The result is the world's first flat frequency response earplugs. They have a cover inside the case that has kept them sterily sealed. Never been opened. The cool Black version. They are in near perfect condition, any missing parts replaced and checked. The batteries are marked as expiring on March 2019. Etymotic MP9-15 Music-PRO. 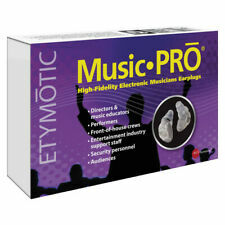 Etymotic MP9-15 Music-PRO Electronic Earplugs. High-Fidelity Earplugs (Large) The world's highest fidelity non-custom earplugs. Clarity of speech and richness of music are preserved rather than muffled. 20db sound reduction across all frequencies. Professional Hearing Protection for Musicians | Live Music | 2 shell sizes included | Discreet 23dB Reusable Musicians Ear Plugs | Maintain audio quality | Includes Aluminium Carry Case | Concerts | Festivals | Gigs | Rehearsals | Nightclubs | Work | IMAX. Fits in your guitar case. Whether you are a musician, attend concerts or are regularly exposed to music played at high levels, Earasers don't plug up your ears and muffle sound like more conventional earplugs. Earasers Musicians Earplugs. Docs Pro Plugs vented ear plugs set with carry case in Medium size. Les Alpine Partyplug sont des bouchons d'oreilles conçus pour une utilisation lors de festivals et de concerts, entre autres. Transparents, ces bouchons sont à peine visibles. De plus, ils restent confortables même après une utilisation prolongée. Ces bouchons permettent de suivre une conversation sans problèmes, idéal pour ceux qui travaillent dans un bar, par exemple. Et grâce à ses AcousticFilters, vous n'aurez pas l'impression d'être isolé du monde. Ces bouchons sont livrés avec une corde permettant de les garder autour de votre cou. Un petit sac que vous pouvez fixer à votre porte-clés est également fourni. If the pictures were taken on the green board - Every square equals to 1 cm. The item is new, taken out of the box to take pictures. Homologations et certifications: EN352-1/EN 352-4/EN352-6: SNR = 25 dB, H = 28 dB, M = 21 dB, L = 16 dBANSI S3.19-1974: NRR = 18 dB. a propos du vendeur. Docs Pro Plugs vented ear plugs set with carry case in Extra Small size. Docs Pro Plugs vented ear plugs set with carry case in Extra Extra Large size. Docs Pro Plugs vented ear plugs set with carry case in Small size. Docs Pro Plugs vented ear plugs set with carry case in Medium/Small size. (Medium/Small size is smaller than Small size). Docs Pro Plugs vented ear plugs set with carry case in Large size. Evita i danni all’udito e il bip nelle orecchie. La qualità sonora della musica rimane uguale. Il solo tappo per musica con tre set di filtri acustici intercambiabili. Vibes Hi-Fidelity Earplugs allow individuals with Autism and other sensory disorders to protect themselves from uncomfortably loud sounds, while still being able to hear everything around them clearly. High-Fidelity Earplugs (Regular) The world's highest fidelity non-custom earplugs. Clarity of speech and richness of music are preserved rather than muffled. 20db sound reduction across all frequencies. Happy Ears® ear plugs are ideal for use at clubs and concerts, in noisy workplaces, while sleeping with low to moderate noise, and for daily wear everywhere by those who are bothered by general background noise. Latest stats revealed one in ten of us suffer from Tinnitus (ringing in the ears). Very comfortable Alpine Thermo Shape material which is barely visible once in place. Help to prevent Tinnitus and save your ears. Etymotic Ety Plugs. Reproduzieren das natürliche Hörverhalten des Gehörgangs. High Fidelity Earplugs. (HIGH FIDELITY HEARING PROTECTION (18dB): Sonica Earplugs Reduce The Damaging High-End Frequencies Your Hear Without Compromising Sound Quality. Suitable For Gigs and Concerts, Musicians During Band Practice, DJ's, Clubbing, Door And Bar Staff, Festivals And Mosh Pits :). Size:Standard Fit Hearing loss from loud sound affects millions of people, but noise-induced hearing loss is preventable! ER20XS high-fidelity earplugs reduce sound levels while preserving sound quality and clarity. Wiederverwendbarer Gehörschutz (vollständig waschbar). zertifizierter Gehörschutz (eignen sich für die individuelle Anpassung an das Ohr (Otoplastik)). Für Musik ist das wunderbar, weil der Zuhörer keine Einbußen am Originalsound hat. Klaisen Audio Shields - Love Audio, protect your ears. We all like to rock. But, we all need to protect our hearing from painful conditions like Tinnitus. For this reason, we designed Rock N Roll HEAROS specifically exclusively for musicians and concert goers. Now you can rock all night without suffering from the morning-after ringing in your ears! Earplugs and case Reduction rating of 26 decibels Reusable Comfortable to wear . Mack's Hear Plugs® High Fidelity Ear Plugs. Includes 2 comfort tip sizes and 1 set of filters. Super-low profile design for inconspicuous wear. MODEL VICEARPLUGR. VIC FIRTH HIGH-FIDELITY EARPLUGS. BLUE TIP-STANDARD / REGULAR FIT. Included earplugs case and neck cord. The earplugs are standard size. Good for music, concerts, clubs travel etc. I am an independent seller so you will get personalized service! Check out my eBay store! EARPLUGS FEATURES. CATEGORY: Earplugs. LANYARD FEATURES. Soft and permanent custom fit. Easy to use instructions. the product. In the unfortunate event. Left and right color coded screws. §Earasers Waterproof Carry Case. Keychain ring provides convenience. Holds one pair of any size Earasers. a pretty image. 150 FREE professional. Spitzengehörschutz mit 2 Filterpaaren. MPN: ERX-MS Easy. Alle Angaben ohne Gewähr. ausgewiesen wird. Anschließend werden Ihnen unsere Bankdaten angezeigt. Der Treffpunkt für Musiker! Trageband und Aufbewahrungstasche. MPN: EQ17DB. Acoustic Guitars. Acoustic Electric Guitars. Ear-Q High Fidelity Earplugs - Acoustic Filter Technology. Ear-Q Acoustic Filter Earplugs - Sold in Pairs. The unique patent pending Ear-Q acoustic filter provides a large open air passage into the ear, minimizing the occlusion effect whilst keeping the ear ventilated for the ultimate user comfort. (HIGH FIDELITY HEARING PROTECTION (23dB): Sonica Earplugs Reduce The Damaging High-End Frequencies Your Hear Without Compromising Sound Quality. Suitable For Gigs and Concerts, Musicians During Band Practice, DJ's, Clubbing, Door And Bar Staff, Festivals And Mosh Pits :). CATEGORY: Earplugs. Soft and permanent custom fit?ÿ. Simple and easy instructions to follow. TECHNICAL SPECIFICATIONS. Made in the USA. Long lasting and washable?ÿ. MusicSafe Pro earplugs are produced from a very soft, flexible and durable thermoplastic material. Due to the warmth of the ear it adapts to the shape of the auditory duct. Therefore, MusicSafe Pro is very comfortable to wear. Die austauschbaren Filter lassen nur einen genau berechneten Teil des Klangs zu den Ohren hindurch. Ear Peace eignen sich perfekt für Musiker, DJs oder für Konzertbesuche. Der Sound bleibt voll und ausgewogen ohne dumpf zu werden oder an Höhen zu verlieren. Die Motorplugs reduzieren die Lautstärke, wobei das Hörerlebnis jedoch Klangtreu erhalten bleibt. Sie hören somit mit den Motorplugs weiterhin wie gewohnt was um Sie herum geschieht. Praktisch für Festivals - die Transportdose bietet dazu noch eine Flaschenöffner-Funktion. You need to hear clearly and comfortably when you play. Zildjian and EarPeace have partnered to bring you the best hearing protection for drumming and live music. Rockem Music accepts no responsibility for claims made after 48 hours.